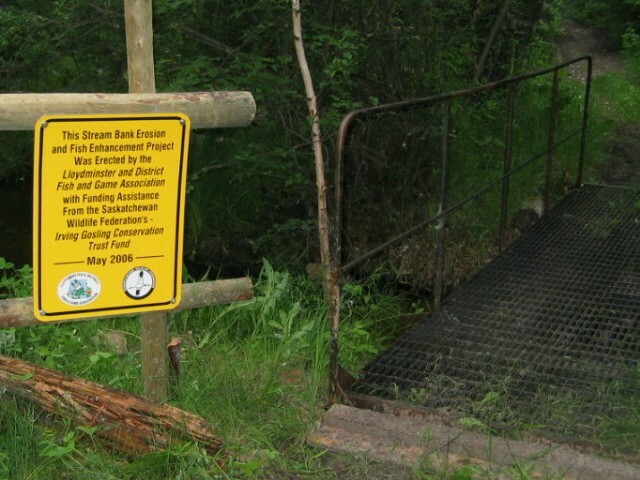 The Saskatchewan Wildlife Federation initiated the Habitat Trust Fund Program in 1978 and the Alberta Fish & Game began a similar program in 1983 called the Wildlife Trust Fund. 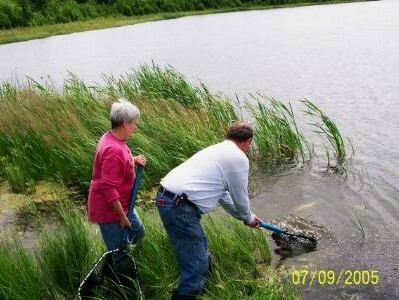 These funds were established because of the concern over the rapidly disappearing habitat in the provinces. If we were able to have wildlife in the future for our children to enjoy we must set aside critical wildlife habitat now. Money is raised for acquiring this habitat by individual tax deductible donations, club donations and many fundraising events and activities across the provinces. 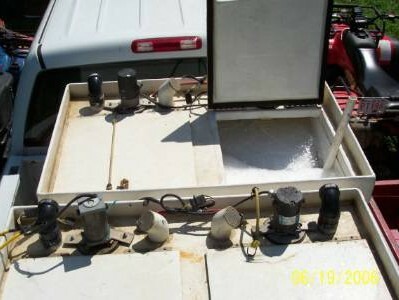 Taxes are paid on all the lands held title to and thousands of dollars are spent each year combating weed and insect infestations on our properties. The Lloydminster Fish & Game has donated in excess of $100,000 to these two funds. 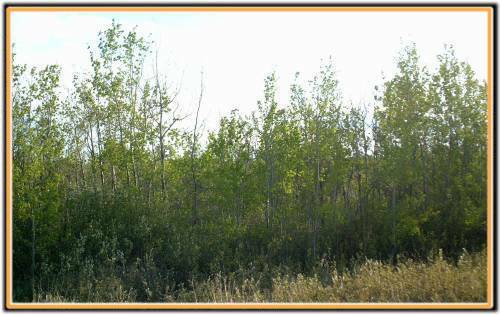 Saskatchewan has secured in excess of 50,000 acres of habitat and Alberta is approaching 40,000 acres. 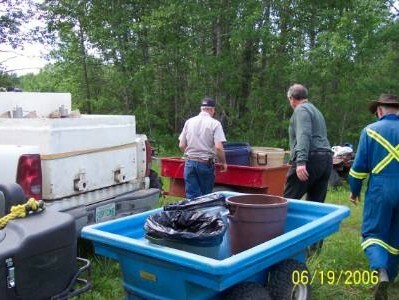 One of the major annual contributions made to these funds us through the Hide Collection Program. 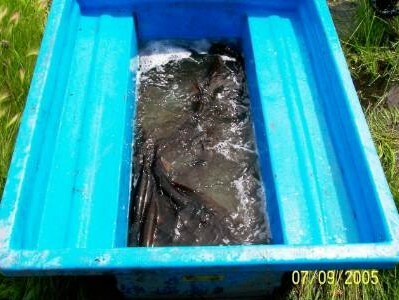 Sportsmen donate their big game hides to the local branches and the proceeds are used to secure habitat in the provinces. Over $40, 000 is raised in each province each year with this program. The Lloydminster Fish & Game Association collected over 250 hides last year and has been able to turn over $1000/year to the provincial trust funds. 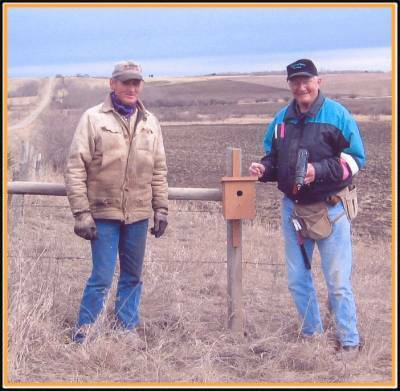 Wildlife Tomorrow Program (formerly Acres for Wildlife) is a program to recognize landowners who voluntarily preserve part of the land base as habitat. Signs are provided to landowners who agree not to break, develop or overly exploit habitat on their land. This is a “gentleman’s agreement” and can be changed at any time. The pioneer land owner is also honored on the sign. Heritage Farmstead Program is a similar program where old schoolyards and farmyards are preserved in their natural state with signage to celebrate their existence. 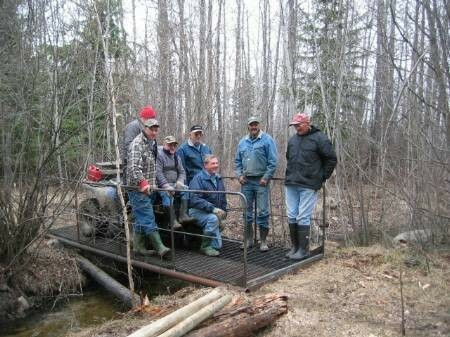 The Lloydminster Fish & Game Association has secured 11 old schoolyards in our area through this program. Guns for Habitat is a recent program that began as some people wanted to divest themselves of their firearms to avoid the bureaucracy and expense of the gun registry laws. In Saskatchewan 504 firearms have been donated to the cause and have sold to raise over $25,000 for habitat programs. 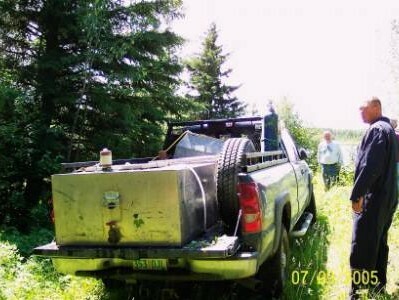 The Lloydminster Fish & Game Association has encouraged members to build and install blue bird houses in the area. This challenge has been accepted and noteworthy efforts have been made by Walt Backer and Bruce McFadyen. 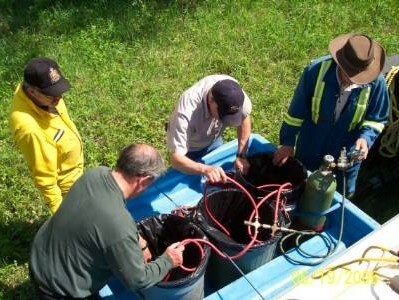 To help the Saskatchewan Environmental Fisheries, trout were brought from hatchery to the area, then oxygen was set up in small tanks on quad trailers for fish to be taken into the remote lakes. 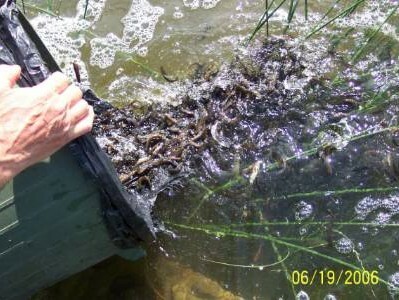 The trout have been stocked and we hope they grow to be strong, healthy fish. Gallery from June, 2006. 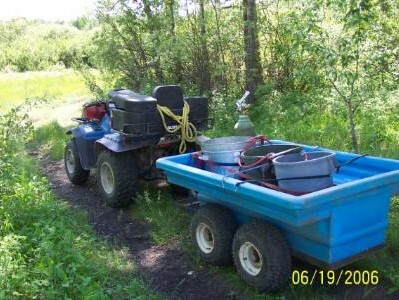 To help the Saskatchewan Environmental Fisheries, we prepared tanks for transportation of pike from their present habitat to Quad trailer tanks and then into the new lake. 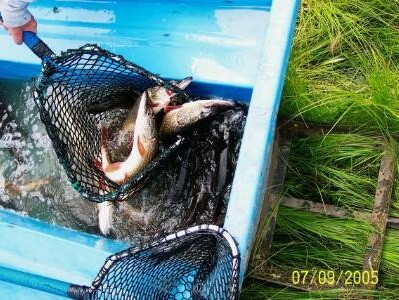 The pike have been successfully moved. Thank you to the many hands who help with all of these projects to enhance our environment. Gallery from July, 2005. 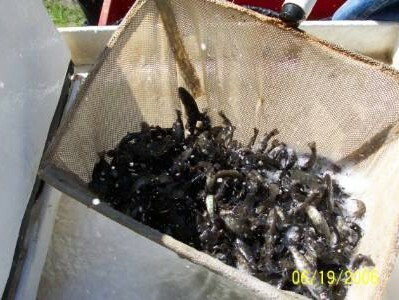 This was a joint project between the LDFGA and the Irving Gossling Fund. 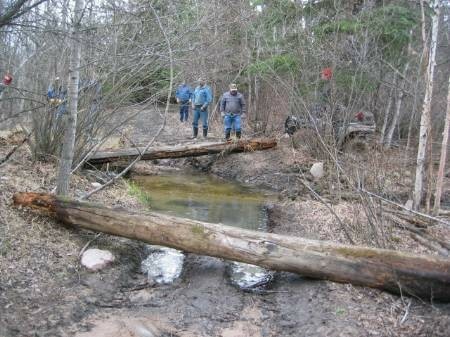 In April, 2006, club members gathered to installed a 15′ by 5′ metal bridge crossing on a creek flowing into Peck Lake so that RVers could cross the creek without destroying the creek banks. 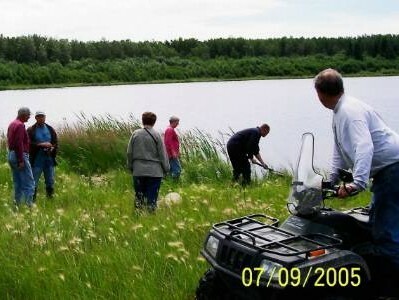 This just another one of the association’s projects to maintain and enhance habitat. The bridge is done and the sign is up. Thank you to all who worked on this project and to the Irving Gosling Conservation Fund of the SWF for help with the funding. 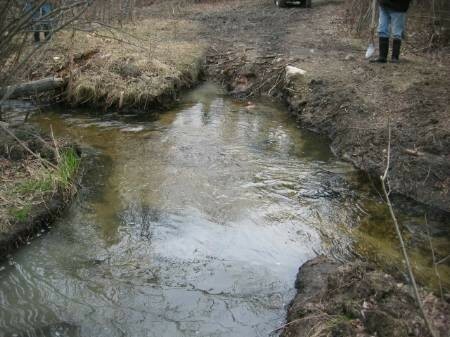 Creek bank was being altered by RV's. 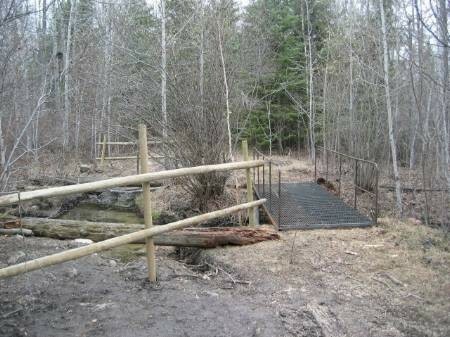 New bridge installed to preserve the creek bank.